Teaching grammar has never been so fun. You no longer need to be afraid of teaching grammar. 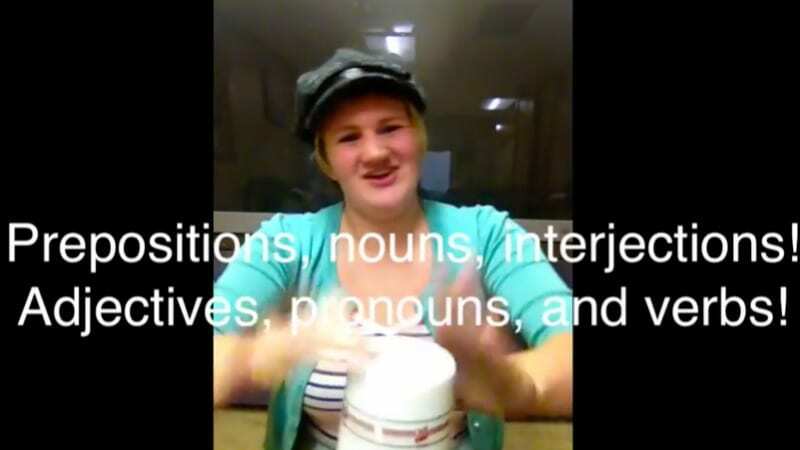 Teaching the parts of speech has never been more exciting or accessible, thanks to the many brave souls who are spicing up our lives with YouTube videos about nouns, pronouns, verbs, adjectives, adverbs, conjunctions, interjections, and prepositions. Get your students singing, dancing, and clapping (or at least actively listening) to our favorite YouTube parts of speech videos. Please, as always, preview any video you show your students. Especially on observation days. Catchy and bright, younger viewers will dig “The Noun Song” and will probably be humming the tune well after it’s over. It must be followed by The Verb Song, of course. Your students won’t have it any other way. This quick video is a high-energy, animated song about—you guessed it—nouns. It includes the lyrics on-screen but also includes the lyrics in the comments so you can print and hand out to students. Conjunction Junction, Lolly’s Adverb Song, The Noun Song, Interjections!, Subjects and Predicates, and more were the staple of elementary school memories for many of us. It doesn’t matter that these videos are grainy and retro. Kids may laugh at first, but they’ll be begging to jam to these songs daily. A little squirrel teaches viewers about nouns, pronouns, verbs, adverbs, adjectives, conjunctions and interjections. This is a super-organized and informative video packed into less than ten minutes. Some pronunciations are off, but we can deal. Andrew has made hundreds of videos for the Crown Academy of English, and the videos range from how to use English proverbs to making telephone calls to understanding how particular words are used. This 21-minute video makes my English-teacher heart sing and dance, it’s so full of information, examples, and a fancy British accent. Marvin Terban is the “Professor of Grammar” who introduces viewers to the parts of speech in a pretty straightforward way. He incorporates “Ivan Capp” into his lesson, and Ivan will help students always remember the names of each of the eight parts of speech. This stand-alone video was created by Salk Middle School and Lauren Apfelbaum, and it’s super short and sweet. Less than three minutes long, there’s no talking in this video. It’s all on-screen reading, so students really have to pay close attention. 8 Parts of Speech—Noun, Verb, Adjective, Adverb, Etc. Ganesh goes into great detail in his “quick introduction” of the eight parts of speech. In under 20 minutes, he provides a pretty thorough overview, and in subsequent videos, viewers can learn a lot more about these building blocks of the English language. I like how Ganesh explains what parts of speech are in the beginning; kids will connect with his simple definition and analogy. The focus of English OMG is to help teach ESL and to inspire teachers of ESL. Teacher Kim is appealing and concise in her explanations without getting too in-depth. Her video library is vast, and each video is only about ten minutes long. I love that she has on-screen text and examples as she narrates each video. This young woman sings an “8 Parts of Speech” song to the tune of “When I’m Gone,” and she even sings it cup-style, a la Anna Kendricks in Pitch Perfect. Everyone will be totally wowed by this singer’s voice, and I’m betting you’ll have a handful of students who will try to do their own versions at their desks. Grammar Girl is the Grammar Queen of the Universe because she breaks grammar down for the people, every day, all day, on every social platform. She has hundreds of videos on her channel, but I love this simple video that teaches students how to diagram a sentence. Learning this important skill will truly awaken the grammarians in all of us. 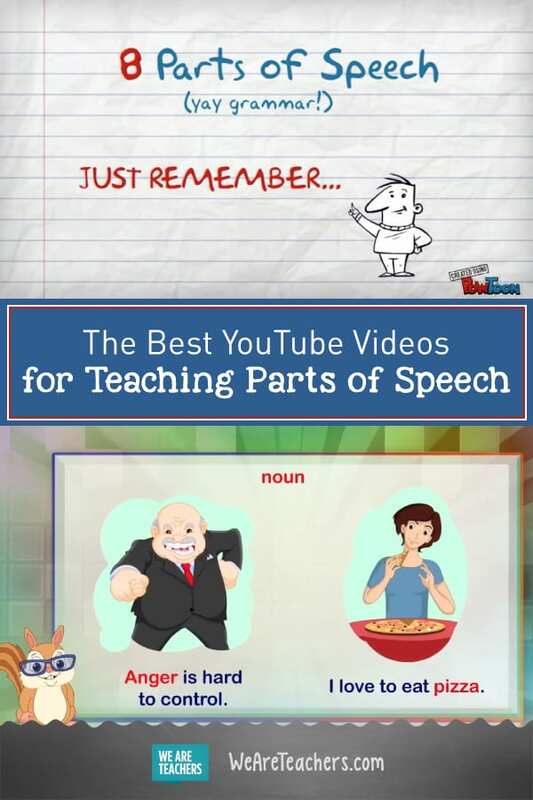 Which of these parts of speech videos are your faves? We’d love to know. Share in our WeAreTeachers Chatgroup on Facebook. How Close Are Teachers to Receiving Poverty Benefits?